Throughout my life, I always felt like the pain had a name nobody could speak. Joint pain in my early teens was dismissed as “growing pains”. Always active, I heard throughout my life that stiffness and pain came from over-doing it with weights or training too hard for a half-marathon. By my thirties, the range of motion in my hip had deteriorated to the point where I could no longer perform yoga exercises that much older clients were performing easily. After years of trial and error, doctor visits without answers and symptoms that could not be controlled, I was referred to a rheumatologist. The rheumatologist did measurements on my spine and my range of motion examination. He looked at the hip x-rays asked a lot of questions about my history of pain and family history of arthritis. He then sent me for an x-ray of SI-Joint and blood work. The blood work came back negative for the HLA B27 gene. However after reviewing the x-ray of the SI joint he told me I had Ankylosing Spondylitis (AS). That was the very first time I heard the name of the disease. He said he wanted to see my SI Joint better and ordered a CAT scan. He told me that ankylosing spondylitis, a chronic inflammatory autoimmune disease that often causes fusion of the spine and related areas. At age 45, I finally had a name for three decades of pain. The diagnosis was a relief. After years of wondering if I was just pushing myself too hard, or if it was something else, I knew my condition had a name. My SI joints are completely fused and part of my lower back. After two years wait on a list, I had a hip replacement and I am dealing with shoulder issues as well. While one might think the disease has ended my active life, it is just the opposite. While I no longer do high impact exercises such as running, exercise is actually part of my treatment routine, along with medication to control the pain and slow the disease’s progression. I attend physiotherapy and focuses on daily swimming and water exercises. I would like to start cycling again in the future. When I do less, I actually hurt more. I find I need a mix – I’m fortunate to work from home and my sit/stand desk allows me to be mobile to avoid stiffness. I swim now, and try to walk as much as I can. I can’t stop moving or being active. It’s something I love and part of who I am. I am very grateful to have a very supportive family. Arthritis makes the caregivers busier. My husband has become very knowledgeable about the disease and helps me with injections every two weeks. He also reminds me when I need to slow down or rest. My three sons have been great to takeover or help with task whenever they know I am in a flare or not feeling well. Although arthritis runs in my family, I had to learn about the disease once it became a part of my life. 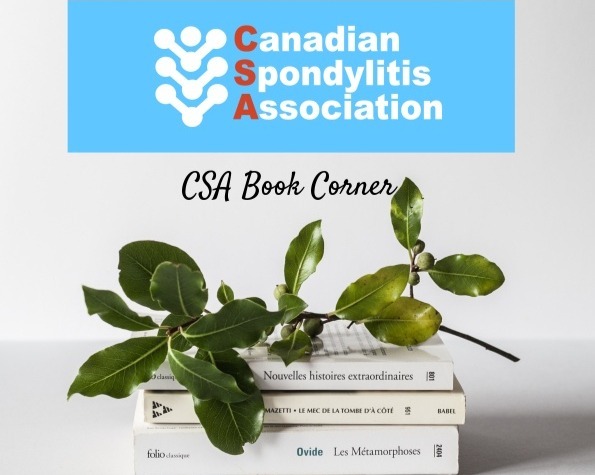 I educated myself, began volunteering for the Canadian Spondylitis Association, and fund raise for the Walk to Fight Arthritis in Halifax, Nova Scotia. People still don’t always associate my condition with arthritis, but most have been very kind and understanding. You never know how this disease affects you until you live it yourself. I want more people to be able to speak to their doctor about it so they can be diagnosed earlier and perhaps not go through the years of pain and uncertainly I faced.